Interest continues to build around pass-the-hash and related credential artifact attacks, like those made easy by Mimikatz. The main focus surrounding this subject has been hardening Windows against credential attacks, cleaning up artifacts left behind, or at least detecting PtH and related attacks when they occur. All of this is important – especially because end-users must logon to end-user workstations, which are the most vulnerable systems on the network. Privileged admin accounts are another story. Even if you eliminated pass-the-hash, golden ticket, and other credential artifact attacks, you would remain vulnerable whenever admin accounts logon to insecure endpoints. Keystroke logging, or simply starting a process under the current user’s credentials, are viable methods for stealing or hijacking the credentials of a locally logged-on user. So, the big lessons learned with Mimikatz and privileged accounts are to avoid using privileged credentials on lower security systems, such as any system in which web browsing or email occurs, or any type of file or content is downloaded from the internet. That’s really what ESAE (aka Red Forest) is all about. But privileged accounts aren’t limited to just the domain admin accounts contemplated by the Red Forest. There’s many other privileged accounts for member servers, applications, databases, devices, and so on. Privileged accounts should only be used from dedicated administrative workstations maintained at the same level of security as the resources being administered. How do you implement controls that really enforce this kind of written policy? And how do you detect attempts to circumvent? I’ll briefly explain each one and show how you can monitor attempts to violate the policies. There’s five logon types and corresponding “allow and deny rights” for each, with “deny” overriding “allow”, of course. You define these in group policy and they are enforced by the local systems in which the group policy objects are applied. For instance, if you have an OU for end-user Workstations and you assign “deny logon locally” to an AD admin group, those members won’t be able to logon at the console of workstations regardless of their authority. If someone tries to violate a “deny logon” right you can catch this by looking for event ID 4625 – an account failed to logon with status or sub-status code 0xc000015b. But be aware that these events are logged via the local workstation – not on the domain controller. This is another reason to use native Windows Event Collection to get events from your workstations. This is something you’d have to specify on individual user accounts as shown below in Active Directory User and Computers. This control only applies to interactive logons. 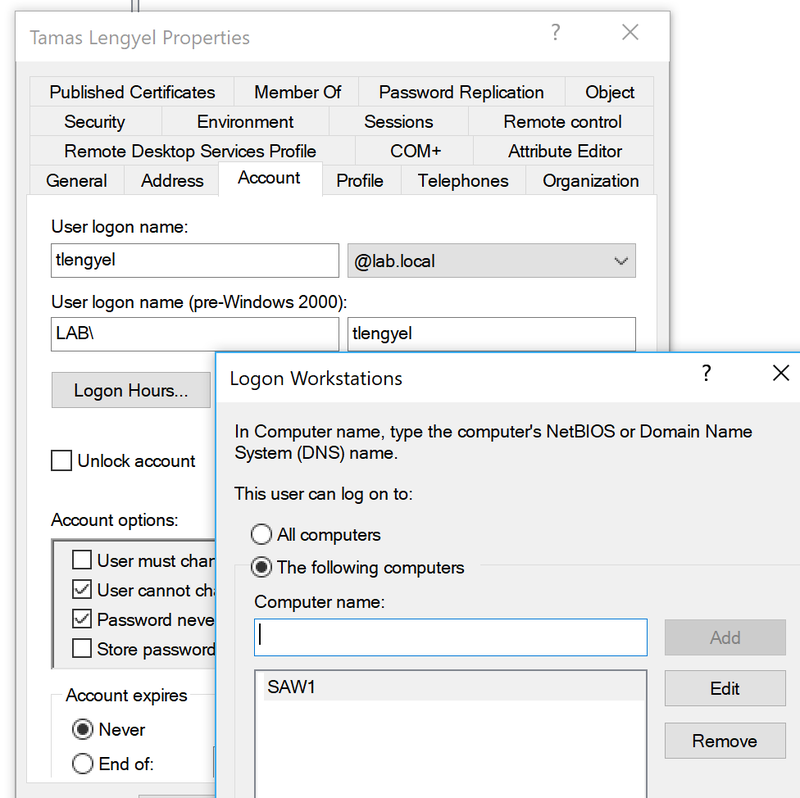 In this example, I’ve allowed Tamas to logon only at SAW1 (secure admin workstation 1). Depending on how many SAWs and admins you have, this could be tedious. If Tamas tried to logon at a different workstation, that computer would log event ID 4625 – an account failed to logon with status or sub-status code 0xC0000070. The domain controller would log event ID 4769 with failure code 0xC. This is a new feature of AD that allows you to carve out groups of computers and users, and limit those users to those computers – centrally from AD Authentication policy silos, which are containers you can assign user accounts, computer accounts, and service accounts to. You can then assign authentication policies for this container to limit where privileged accounts can be used in the domain. When accounts are in the Protected Users security group, additional controls are applied, such as the exclusive use of the Kerberos protocol. With these capabilities, you can limit high-value account usage to high-value hosts. Learn more about silos in Implementing Win 2012 R2 Authentication Silos and the Protected Users Group to Protect Privileged Accounts from Modern Attacks. When a user tries to logon outside the silo of permitted computers, the domain controller will log event ID 4820: A Kerberos Ticket-granting-ticket (TGT) was denied because the device does not meet the access control restrictions. Bad guys have more methods and shrink-wrapped tools than ever to steal credentials, so it’s especially important to lock down privileged accounts and prevent artifacts of their credentials from being littered throughout your network where the bad guys can find them. Windows gives you controls for enforcing such policies and provides an audit trail when someone attempts to violate them. Remember that besides just non-compliant or forgetful admins, these events may signal a bad guy who’s successfully stolen privileged credentials but is unaware of the controls you’ve put in place. So, take these events seriously.